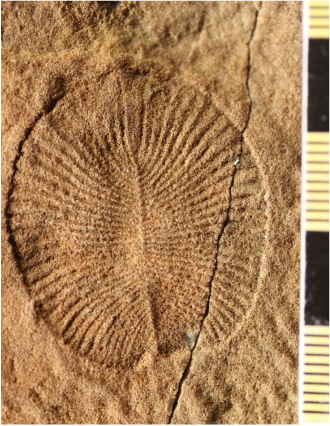 Dickinsonia is a particularly iconic member of the Ediacaran biota, and was one of the original fossils found by Reg Sprigg in South Australia when he first discovered fossils in the Ediacara Hills (Sprigg, 1947). It is one of the best studied of all Ediacaran taxa, and also one of the most controversial. Suggestions of what it might have been include a lichen (Retallack, 2007), and a giant protist (Seilacher et al., 2003), but in recent years, research into trace fossils (Ivantsov, 2011), development and growth (Gold et al., 2015; Hoekzema et al., 2017; Reid et al., 2018) and biomarkers (Bobrovskiy et al., 2018) have all pointed towards Dickinsonia being an animal. Amongst the animals, morphological analyses have suggested possible shared common ancestry with living marine parasitic worms (Wade, 1972), Cnidaria (Erwin, 2008), Ctenophora (Zhang & Reitner, 2006), Platyhelminthes (flatworms) (Conway Morris, 1981), and more recently with the Placozoa (simple basal invertebrates) (Sperling & Vinther, 2010), but the precise position of Dickinsonia within the animal tree remains uncertain at present (Dunn et al., 2018). There are reports of internal anatomical features preserved within some Dickinsonia specimens (Dzik, 2003; Zhang & Reitner, 2006), although some authors consider these to be taphonomic in origin (Brasier & Antcliffe, 2008). Several species of Dickinsonia have been described, and the genus is currently undergoing taxonomic revision by workers in both Australia and Russia. High density populations of the organism have enabled studies into palaeoecology, for example recognising evidence for primary succession in some Dickinsonia communities (Reid et al., 2017). As Dickinsonia grew, it added segments to its body, gradually becoming longer (Wade, 1972). Trace fossils (called Epibaion; Ivanstov, 2011) associated with Dickinsonia are interpreted as evidence of feeding, with the organism thought to have digested underlying microbial mat and then absorbed it through its lower surface (Seilacher et al., 2005). The image below shows the body fossil impression of a large Dickinsonia costata, and several trace fossils created by the organism (Coutts et al., 2016). ​One species of Dickinsonia, D. rex​, was capable of growing to almost 1 metre in length! Dickinsonia specimen P49377 (left) and trace fossils (left to right) from the South Australian Museum. Modified from Coutts et al. (2016). ​Dickinsonia costata is one of the smallest species of Dickinsonia, with a low number of units along the length of its body. The smallest known fossils are less than 4 mm long. D. costata was one of the most common species of Dickinsonia on the Ediacaran sea floor in shallow marine, sandy settings in South Australia. 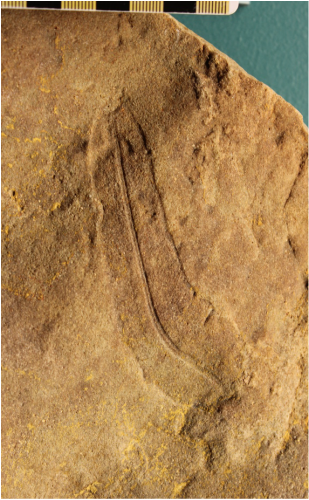 ​On several beds at the Ediacara fossil site Nilpena Station in the Flinders Ranges, the edges of many D. costata specimens were found to have been 'lifted' by the prevailing current during the burial event, suggesting that Dickinsonia were free-living, flexible, non-attached organisms (Evans et al., 2015). Recent studies have suggested that Dickinsonia was a bilaterian animal (Gold et al., 2015), and that it demonstrated highly regular growth via the addition of new body 'modules' (Evans et al., 2017; Hoekzema et al., 2017). Broad, flat polychaete worms, growing to large size; with left and right halves of anterior body-segment fused together pre-orally; with intestinal caeca that branch dichotomously around pharynx; pharynx situated at centres of first few segments; segmental furrows depressed dorsally and ventrally; dorsal lamellae rarely fossilized. Dickinsonia tenuis had the most units/modules relative to the size of the organism of any Dickinsonia species, and achieved a longer and narrower overall shape than D. costata and D. rex. Some small specimens have over 100 segments. Dickinsonia tenuis. Photographed at the South Australian Museum, South Australia Image: Dr Alex Liu. 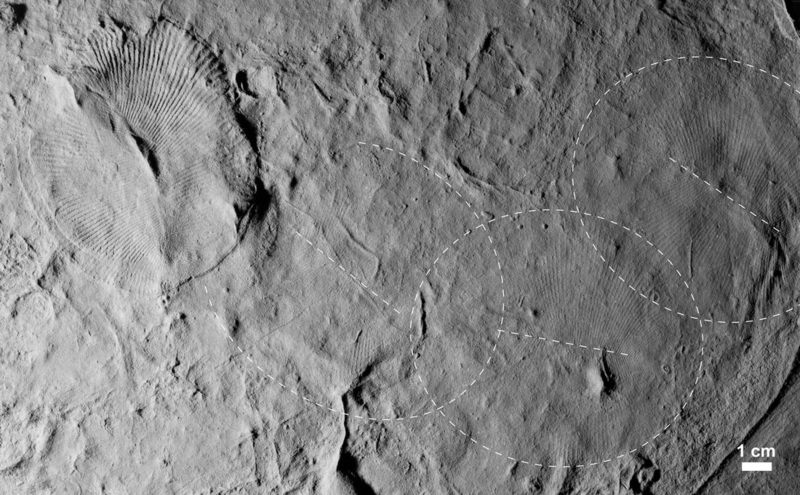 Rounded to elongate outline, very short segments, numbering up to several hundred. They are three or more times as numerous as in specimens of D. costata or D. elongata of the same length. Dickinsonia rex grew to the largest size of all known Dickinsoniids. The specimen in the photograph below is over 80 cm long! Large Dickinsonia rex. Photographed at the South Australian Museum, South Australia. Image: Dr Alex Liu.